Additional Sessions Judge S. Lal convicted the Talwar couple for the murder of their daughter Arushi and their domestic help Hemraj based on the circumstantial evidence in the case. There were no eye witnesses to the incident. The Judge relied on a number of Supreme Court Judgments in which the principles relating to the appreciation of circumstantial evidence, including the Constitution Bench Judgment of the Hon'ble Supreme Court in Govinda Reddy Vs. State of Mysore AIR 1960 SC 29, and Hanumant Govind Nargunkar Vs. State of M.P. AIR 1952 SC 343. The judge heavily relied on the following principles which are known the ‘Panch Sheel’ of the proof of a case based on circumstantial evidence. 5. 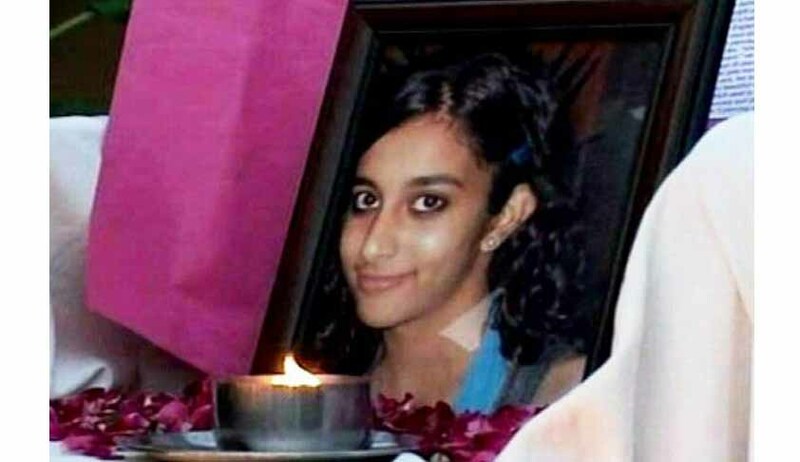 That the door of Aarushi's bed-room was fitted with automatic click-shut lock. Mahesh Kumar Mishra, the then S.P. (City), NOIDA has deposed that when he talked to Rajesh Talwar on May 16, 2008 in the morning, he had told him that in the preceding night at about 11.30 P.M. he had gone to sleep with the key after locking the door of Aarushi's bed-room from outside. Both the accused have admitted that door of Aarushi's bed-room was having automatic-clickshut lock like that of a hotel, which could not be opened from outside without key but could be opened from inside without key. No explanation has been offered by the accused as to how the lock of Aarushi’s room was opened and by whom. 17. That it is not possible that an outsider(s) after committing the murders will muster courage to take Scotch whisky knowing that the parents of the deceased Aarushi are in the nearby room and his top priority will be to run away from the crime scene immediately. “Now is the time to say omega in this case. To perorate, it is proved beyond reasonable doubt that the accused are the perpetrators of the crime in question. The parents are the best protectors of their own children- that is the order of human nature but there have been freaks in the history of mankind when the father and mother became the killer of their own progeny. They have extirpated their own daughter who had hardly seen 14 summers of her life and the servant without compunction from terrestrial terrain in breach of Commandment 'Thou shall not kill' and injunction of Holy Quran- “Take not life, which God has made sacred”. They are also found guilty of secreting and obliterating the evidence of the commission of the murders to screen themselves from legal punishment”. If we protect “Dharma”, Dharma will protect us. If we protect “Law”, law will protect us. Both the accused have flouted the ferocious penal law of the land and therefore, liable to be convicted under sections 302 r/w 34, 201 r/w 34 I.P.C." The accused Dr. Rajesh Talwar and Dr. Nupur Talwar are convicted under sections 302 read with section 34 and section 201 read with section 34 I.P.C. Dr. Rajesh Talwar is also convicted under section 203 I.P.C. Both the accused are sentenced to rigoures imprisonment for life under section 302 read with section 34 IPC with a fine of Rs.10,000/- each and in default of payment of fine to undergo six months simple imprisonment and to five years rigorous imprisonment under section 201 read with section 34 I.P.C. with a fine of Rs.5,000/-each and in default of payment of fine to undergo simple imprisonment of three months. Dr. Rajesh Talwar is also sentenced to one year simple imprisonment under section 203 I.P.C. with a fine of Rs.2,000/- and in default of payment of fine to undergo simple imprisonment of one month. All the sentences shall run concurrently. One copy each of the judgment be provided free of cost to the accused immediately. Both the accused shall be sent to jail under a warrant to serve out the sentence as imposed upon them. Material Exhibits shall be disposed off as per rules, after expiry of the period of limitation for filing the appeal, if no appeal is filed. The accused shall be sent to District Jail under warrant of conviction. The copy of the judgement should be sent to the District Magistrate, Ghaziabad in terms of section365 Cr.P.C.